"My entire life people tried to rattle my cage, to force me to explode from the inside out." 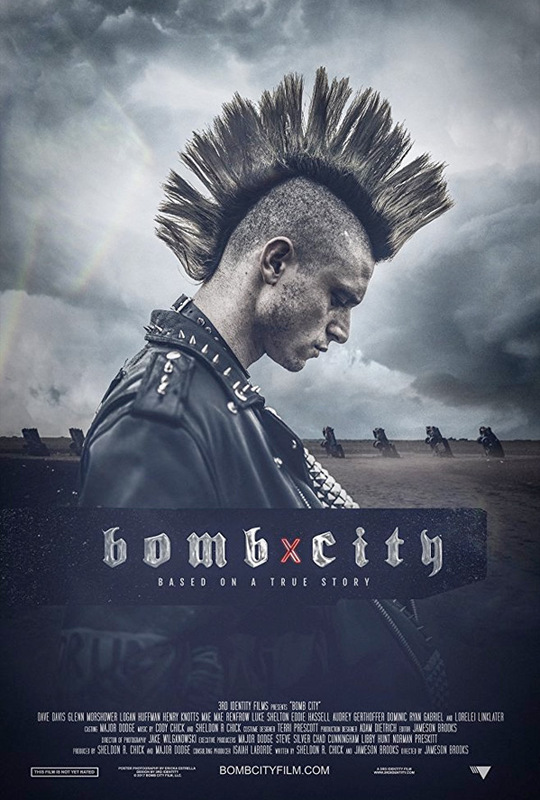 Gravitas Ventures has unveiled an official trailer for an indie drama titled Bomb City, based on a true story of a punk rock hate crime in Amarillo, Texas in 1997. The title Bomb City refers to the name of a rundown venue where a guy known as Brian Deneke hosts punk shows. After losing a football game, high school jocks from a group known as the "white-hatters" start a big street fight with the punks. Dave Davis stars as Brian, and the cast includes Glenn Morshower, Logan Huffman, Lorelei Linklater, Eddie Hassell, Henry Knotts, Maemae Renfrow, Dominic Ryan Gabriel, Luke Shelton, Cody Cates, with Marilyn Manson. This looks like a damn good film, with what seems to be a stellar performance from Dave Davis. Worth a watch. Winter 1997. Amarillo, Texas. Brian Deneke is known for his green mohawk and undying passion for punk music. He throws punk shows with his friends at a rundown venue known as “Bomb City.” And Brian, along with many of his fellow “punks,” refuses to conform to the conservative culture that surrounds them. Their radical appearances stir social intolerance within the community, particularly with Cody Cates, a high school jock who assimilates to a pack known as “white-hatters.” After losing a football game, Cody and a few other white-hatters have an altercation with several of the punks. This conflict ignites a series of hostile encounters between the two groups, climaxing one evening with a horrific, violent street fight. The night would soon become notorious for being one of the most controversial hate crimes in modern American culture. Based on a true story. Bomb City is directed by American filmmaker Jameson Brooks (aka Jamie), making his feature directorial debut after a number of shorts. The screenplay is by Jameson Brooks and Sheldon Chick. This premiered at the Dallas Film Festival this year, and played at the Tallgrass Film Festival. Gravitas will open Bomb City in select US theaters + on VOD starting February 9th, 2018.